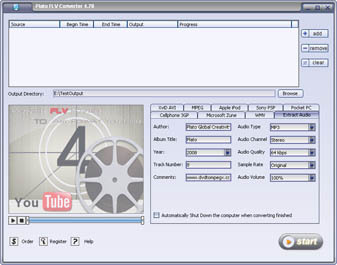 Plato FLV Converter is an idea program for anyone. It enables you convert Youtube FLV video files to divx, xvid, avi, wmv, mpeg, ipod mp4, psp mp4, cellphone 3gp, zune mp4/wmv video and Extract Audio from FLV to MP3/WMA/OGG/WAV. Simple settings ,high speed, friendly interface , go to download it and have a wonderful try! Key Features: 1).Convert FLV to DivX/XviD AVI files. 2).Convert FLV to iPod/iPhone/AppleTV mp4 video. 3).Convert FLV to PSP mp4 video. 4).Convert FLV to Cellphone 3GP video. 5).Convert FLV to Microsoft Zune mp4/wmv video. 6).Extract FLV Audio to mp3/wma/ogg/wav audio file. 7).Set the start position and end position of source file to convert. 8).Support batch files conversion. 9).Support many predefined profile setting for output video. 10).Customize the quality of output video. 11).Automatically shutdown your computer after long time conversion, such as for big files conversion at midnight. We guarantee free update, free te-support and 30 days money back . Go to download it and experience a new lifestyle!